Widmer E-3 Electric Seal Embosser - New Phoenix Inc. The Widmer E-3 Electric Seal Embosser is an efficient, immediate and precise embosser, perfect for single sheet certificates, diplomas and legal documents. The Widmer E-3 Electric Embosser is an efficient, immediate and precise embosser, perfect for single sheet certificates, diplomas and legal documents. The trigger mechanism can be set to the same consistent depth. The Widmer E-3 Electric Embosser is instantaneous, accurate and available at the affordable low cost! The E-3 is perfect for single cut-sheet certificates, diplomas and legal documents. Single hand operation – no buttons to push! The Trigger Mechanism can be set to at the same consistent depth. A Optional Guide Shelf is available to allow for correct positioning every time! The stamping pressure can be easily electronically adjusted so that “dies” do not cut through the document! The seals can have simple engraving, text only at the base price or complex designs on quote. Seals can print on the edge of the document, using extension trigger option, or up to a maximum of 3· in depth. There is no standard trigger depth as it would vary with the diameter of the seal. Certify documents in less than a second! Legal Document “Certification” in less than a second! The need for secure, original documents in today’s volatile world has become a major concern. An embossed document cannot be photocopied, photographed, or otherwise duplicated. Embossers are used by many federal, state, county and city government offices for legal document control and validation. 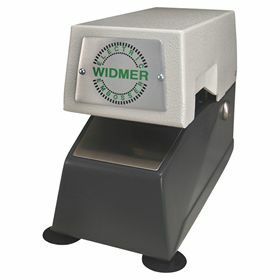 Our Widmer E-3 Embosser is a heavy duty seal embosser that is perfect for state and corporate seals. Customize your Widmer E-3 embosser with an electric security lock, visual counter, foot pedal stamping, extension triggers, and more. Our transcript validator is a government and corporate seal embosser. In addition to embossing the corporate logo, the Widmer Transcript Validator prints a combination of signature, title, date, and an additional text line in one easy step. Simply plug into an ordinary AC lighting circuit and insert paper into throat to emboss your paper. Validate and Secure “Original Documents”…ideal for single sheet Certificates, Diplomas, and Legal Documents. NOTE: Sample Document required with order. State Seals…all 50 States are available. NOTE: In the event of an order cancellation or refund, the unit is subject to a 15% restocking fee, due to the customized features included with this unit. Please allow 2-4 weeks for delivery.